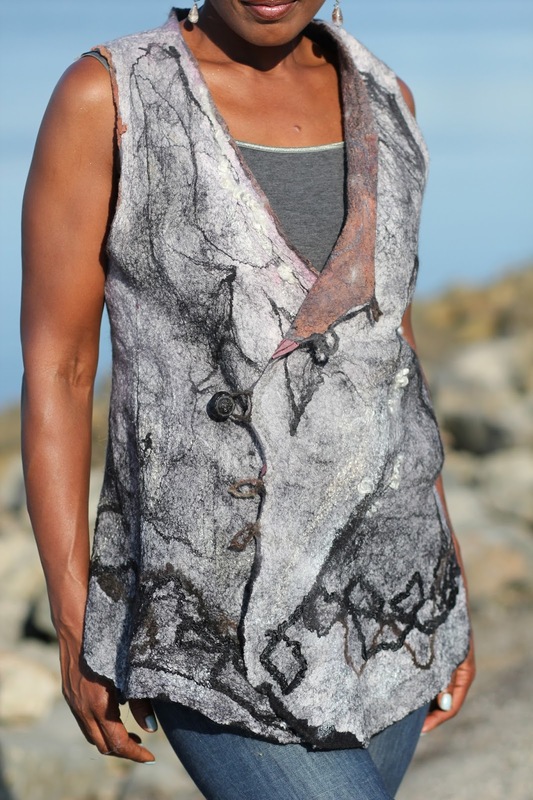 Studio 907: Making a Nuno Felted Seamless Reversible Vest Using a Resist. 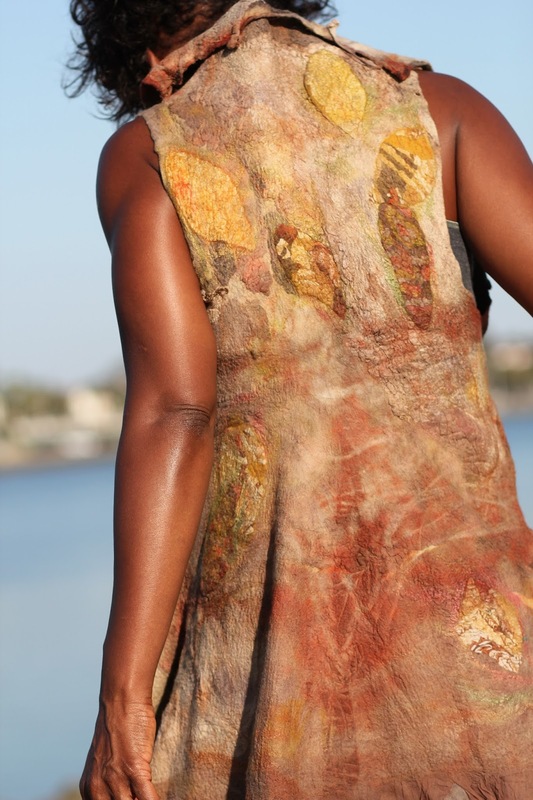 This is a reversible seamless nuno felted vest with hidden pockets in the seam. I bought the vintage button at the Paris flea market years ago so it really is special. 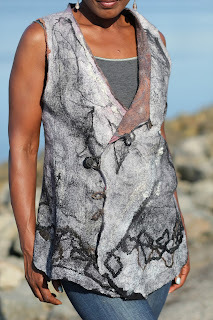 For one side of this vest, I used silk gauze pieces that I had previously bundle dyed in a pot of eucalyptus. I also used pre-felts cut into leaf shapes. 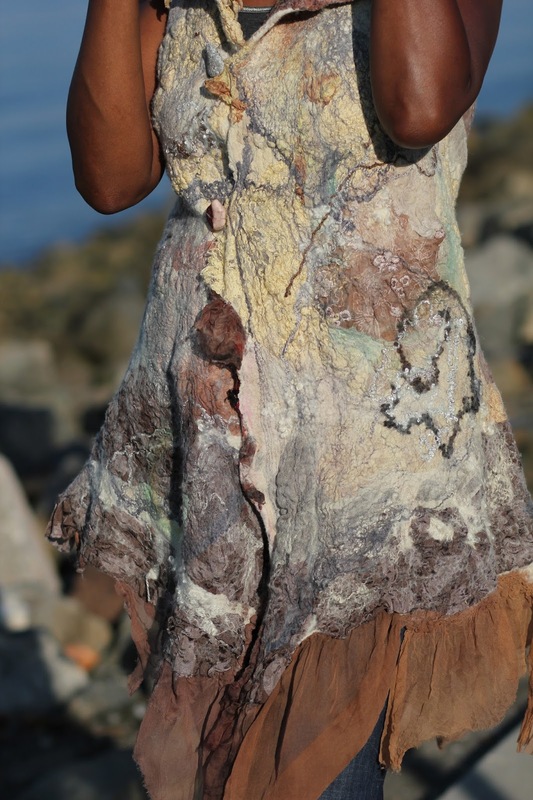 For the other side, I used plain white silk. One layer of super fine white merino wool was sandwiched between the two layers of silk. I then printed/bundle dyed the white side with eucalyptus leaves. I make my templates/resists from floor under layment which is nice and sturdy and holds up well to the soap and water. You can buy it in a roll at Home Depot or Lowes. Cover the table with towels or something absorbent. 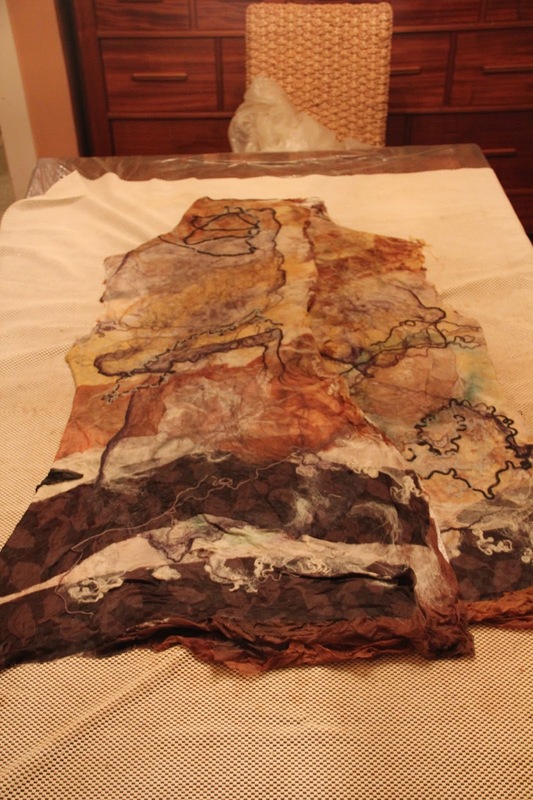 I now use a large welping pad which I bought on-line at Petco - got this terrific tip from Dawn Savage who I met at Jean Gauger's butterfly jacket workshop in Portland in May, 2013. Put down your bubble wrap or non skid rug pads which is what I now use. A great tip from Jean Gauger. Place painters plastic on top of the rug liner. Place your resist on top of the painter's plastic. 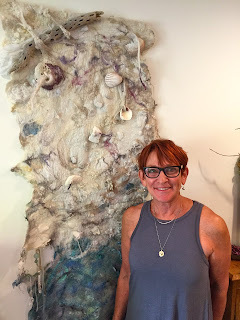 I use white super fine merino wool roving for a lot of my projects. 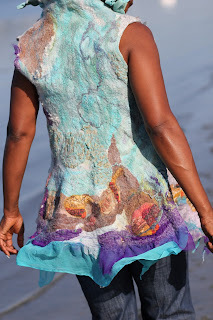 My recent trip to the Caribbean was my inspiration for this vest which I'm calling Crane Beach - Barbados. It is seamless and reversible and is beautiful on both sides which are lined with vintage buttons. Here I've laid out the back and one side of the front. Now I'll add a second resist and lay out the second side of the front on top of it. Work in process on the vest. The resist is between the layers and will be removed after extensive rolling. 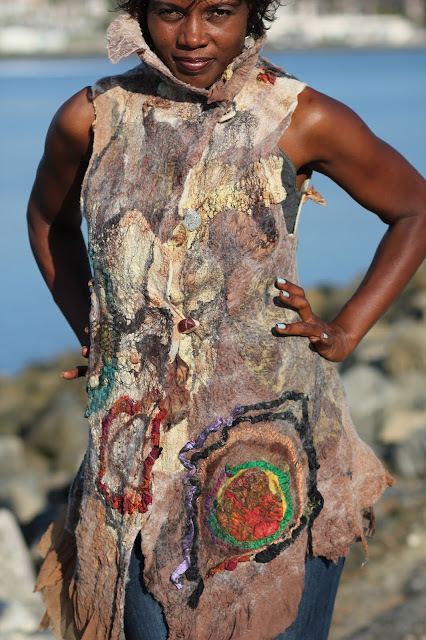 Another reversible seamless nuno felted vest made using hand dyed fabrics, re-purposed garments and fabrics, pre-felts, vintage sari silk and more. I made the buttons from little stones which I collect on my travels. It looks just like granite so I'm calling it "Climbing Half Dome". 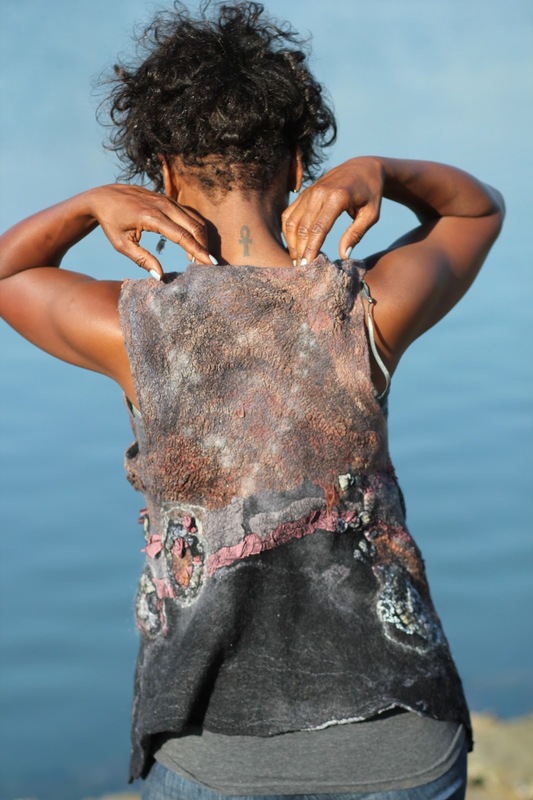 A resist was used for the vest allowing for 30% shrinkage. 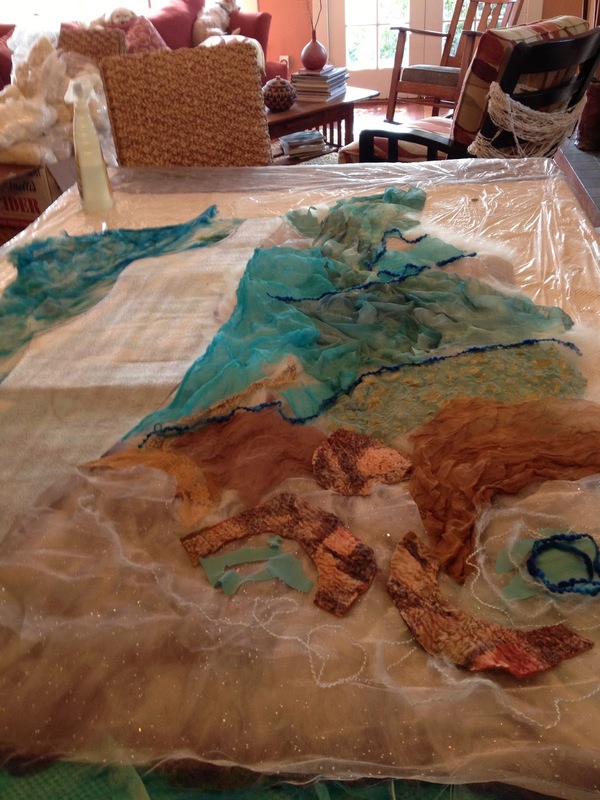 Silk hankies, sari ribbons, tussah silk and yarns were laid down first. The vest is wetted out and ready for rolling. The resist is between the layers and will be removed once the garment starts to shrink and it has initially held together. 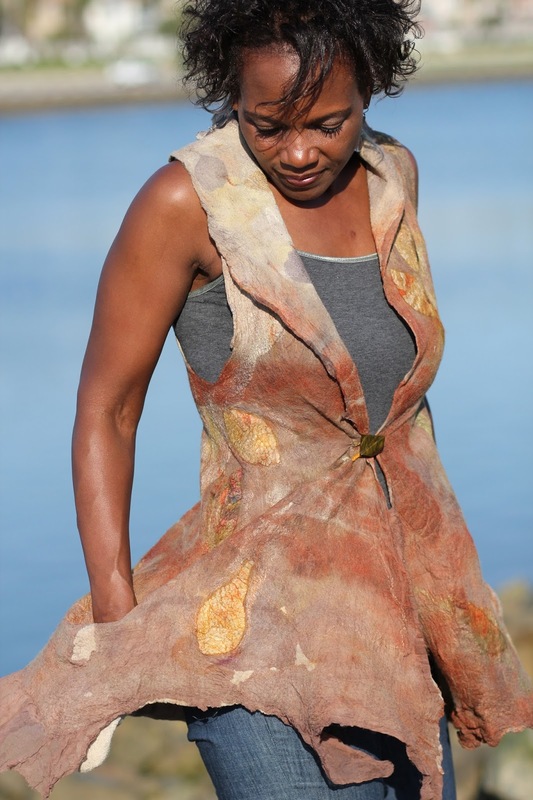 Another reversible seamless vest made with one layer of roving sandwiches between two layers of silk. One vintage button is used for the closure. The garment was made using a resist. I like the hidden pockets! beautiful work! but I don't quite understand how the resist works. 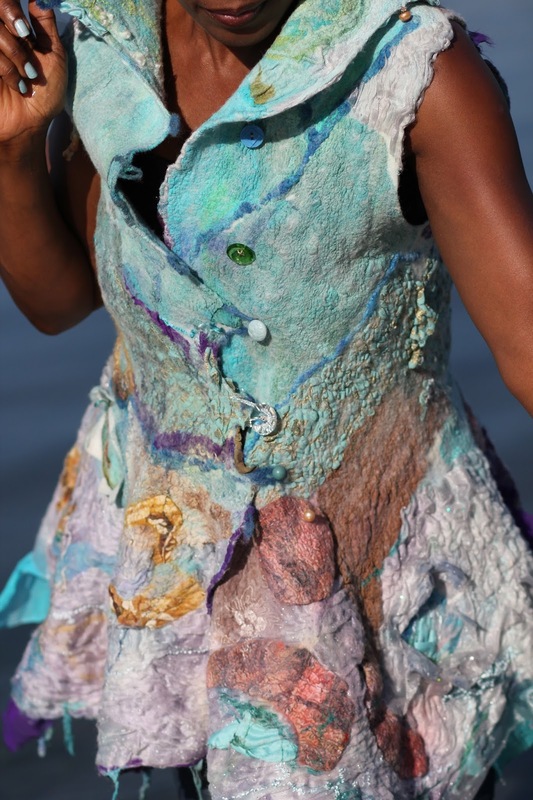 do you sew them together first? how do you keep the edges from forming a crease? 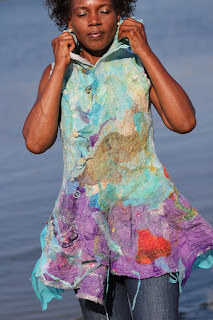 No sewing at all. 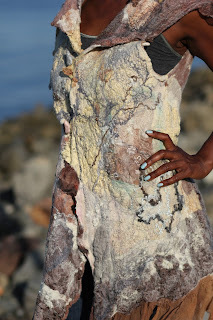 Basically you extend the wool roving and silk fabric over the edges at the side and shoulder seams from the back of the resist to the front and vice versa. You smooth out any creases during the process. 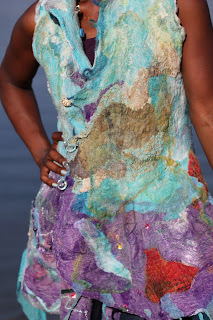 Will u b giving any workshops soon? I plan on giving more workshops in 2015. 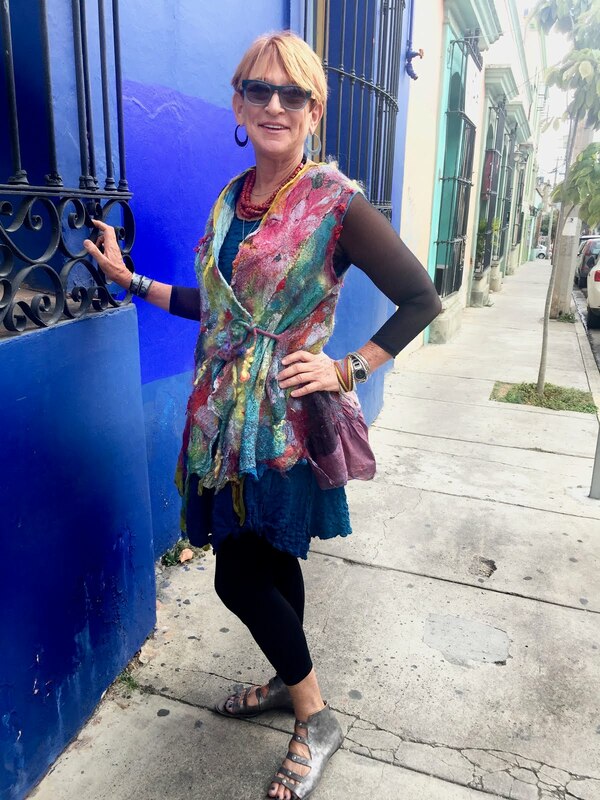 Please email me at: bethmarx@mac.com so I can add you to my list. Thanks. Thank you so much Mary Jane, much appreciated. 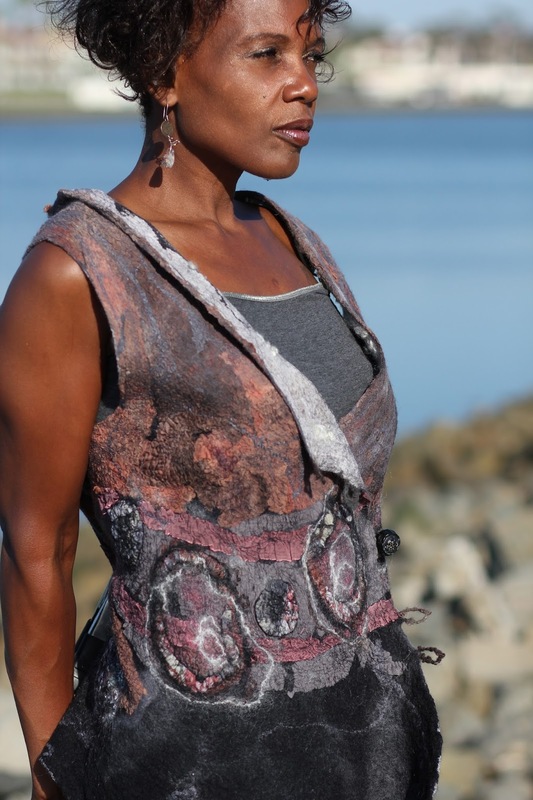 I plan on having a vest workshop in Spring 2015 and I have you on my list. Thanks and will do Susan. Thanks Cynthia for your interest. I have added you to my email listing. I plan on having a workshop in March 2018 in Southern California so stay tuned.